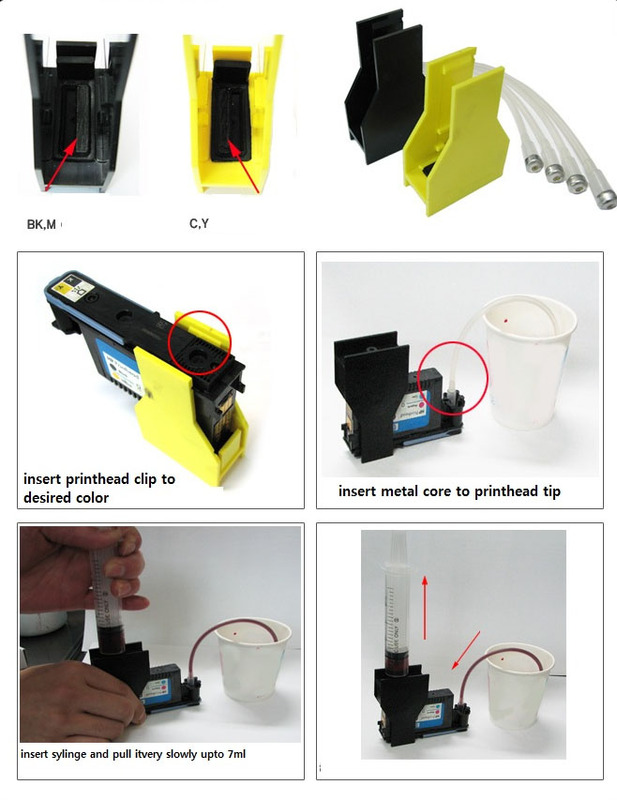 This suction clip works for unclogging printhead repair your ink cartridge. 1. pull up after clip installed on desired clog color, if it won’t able to pull, the you head clogged. 3. After 15 min, pull syringe back, then you may hear little air suction noise, if syringe able to pull up and suction out old ink, then its unclogged. Sometime if you had that printhead clogged for long time then it may not able to unclog. Then you have to disassemble the printhead to rinse out all sludge’s in the printhead. To remove sludge ; type hp 940 printhead cleaning on youtube, you may find some information. If you feel like its unclogged but not enough, then do it again. To get all best result use right tools and material. If you think you can not fix it, then do not attempt to do it, just send it over to me. Contact to me before you send, I will send you shipping information & packing guide. It will takes couple day to fix it, but it is not guaranteed !, it may not able to repair if it has film damaged, nozzle burned, any chip damaged. I am a expert printer technician and have all that right tools. I do not take return for purchased item even you did not use it if you ask me to fix it. But this tool is very useful. 1000ml printhead cleaning solution for most Pigment Ink printheads - some printheads may need specia.. Product FeaturesHP 940 printhead Refurbished in the USA by Professional TechniciansRefurbished with ..
ekuten™ is a registered trademark of ekuten Inc., the ekuten™ logo and all the photos of our products are properties of ekuten Inc. Copyright © 2016, ekuten - Pro Ink Shop, All Rights Reserved.